Scorpion is a roller coaster in Pantopia at Busch Gardens Tampa. It's worth seeing on a time-permitting basis. The minimum height to ride is 42 inches. 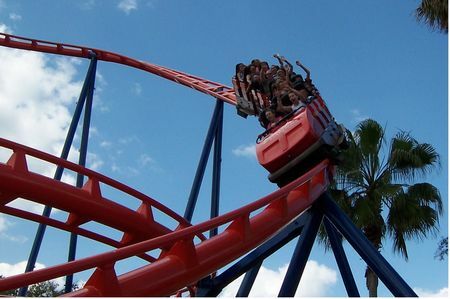 The Scorpion roller coaster is an Anton Schwarzkopf-designed Siverarrow looping coaster. Installed along with the Timbuktu section of the park in 1980, the peak height of the coaster is the vertex of the lift hill, 60 feet in the air. After reaching this point, riders twist as they hurtle downwards into the signature, singular looping element. Trains then emerge from a pretzel turnaround threading the loop to reach a 900° helix, and then enter the braking sequence.